Do you ever have those moments at the market – mainly the farmers market for me – when you buy something, having absolutely no idea how you’re going to use it? I do this all the time. In fact, I do it almost every time I enter a market. I get drawn in by beautiful colors, the freshness of the produce or often just the novelty of something I haven’t worked with before. I had the epitome of one of these moments at the farmers market last week. Even though my list was already crossed off, I returned to one of the stalls to look for smaller onions. Upon entering I noticed something I had not seen the first time around – pea shoots! I don’t think they’ve been at my market before and I’ve never cooked with them, but I had to have them. 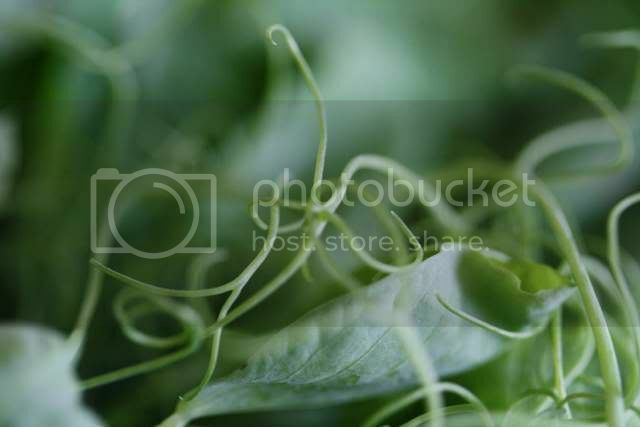 They were a gorgeous green with fresh, firm stalks that had the most delicate trailing tendrils. It may have been my overexcited imagination, but I’m pretty sure they still had garden dew on them too. In most cases, when I have these “moments” I spend the next few days trying to figure out how to use the purchased item, wondering why I had bought something I had no planned use for, yet again. Not so this time! It was only a matter of hours before I got a shot of inspiration. While working on a puff pastry tart for a date with a group of friends, I realized I really needed a sauce to serve as the base. I dismissed tapenade as not everyone loves olives (they’re crazy, but it’s true) and decided a pesto would be perfect. Unfortunately I had no arugula or basil, my usual pesto bases, but I did have pea shoots. And what if I could turn those into Pesto? A quick internet search revealed that I’m not quite the genius I thought I was and this has in fact been done before. Even so, not that many hits came up and since it would be a new experiment for me, ahead I trudged. The resulting pesto was delicious. This is trite, but it really tasted like spring in my mouth. Fresh, like cut grass, it hinted at the approaching season when markets will be bursting with all that spring has to offer. For now, I’m happy with my Pea Shoot Pesto to tide me over. Add first five ingredients to a food processor and pulse until roughly chopped. With the processor running, drizzle in the olive oil. You may not need a full half cup. Just keep drizzling until the pesto comes together and reaches a consistency you like. Remove the lid from the processor and stir in the parmesan by hand. What a lovely pesto! I have never heard of pea shoots! 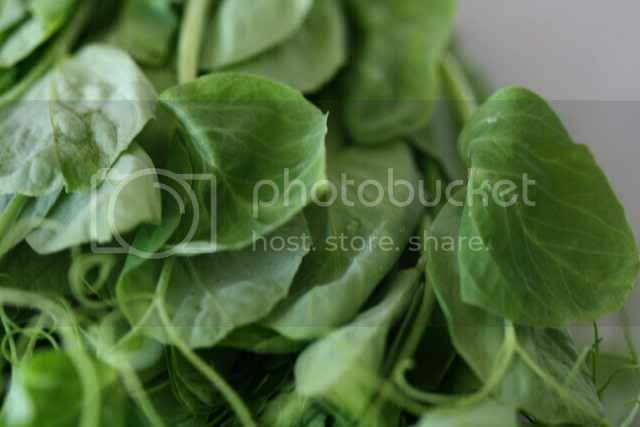 I love pea shoots, they don't usually show up in my farmer's market for another month though! I am going to check next week to see if they are here early this year. I can't wait for Spring and interesting vegetables at the market. How cool! I have never heard of these before but they are just gorgeous! I need to get more adventurous in my selections! I don't think I've ever even seen a pea shoot before. Good for you - every time I have one of the impulse buys the item usually ends up just spoiling before I can figure out what to do with it! Oh god I'm jealous! No sign of pea shoots in New York for MONTHS. I always just saute them with a little garlic and salt (I am always so impatient to eat them! ), but this sounds fabulous! Maybe a little mint would be a nice addition? I have sweet peas growing in my garden right now, Can I use these? I am soooo happy I found your Blog... You inspire me evry morning as I sip my coffee. Laura - love the idea. I'm going to saute my remaining bunch! Anonymous - I assume you're referring to sweet peas the flowers? I don't think those would work. 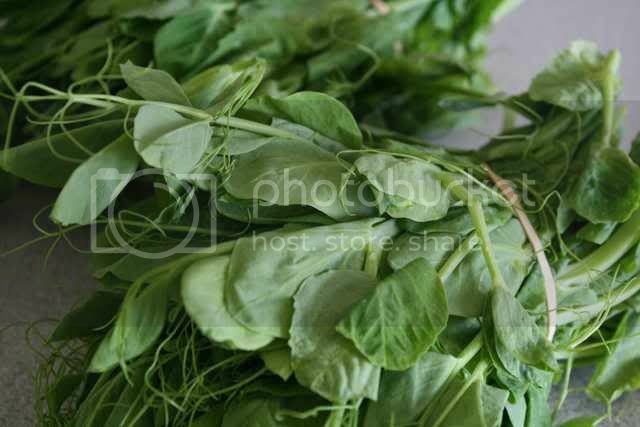 Pea shoots are harvested from the young/growing tip of a pea plant (so any edible pea plant). I haven't been able to find anything that says you can harvest pea shoots from the sweet pea flower. Let me know if you find out something else and thanks for your sweet words about A&B! oh wow, great idea. makes me seriously, seriously long for spring. we're still stuck with root vegetable and apples (not that I don't like root vege. and apples, but I'm ready for some pea shoots and maybe some asparagus??) thanks for this - must bookmark for Spring! I LOVE pesto but have never even thought of trying with pea shoots-good job! How clever! I always overbuy at my farmer's market too. Right now I have a fridge full of small shitake mushrooms. Not nearly as challenging of an ingredient as pea shoots, but I'm still struggling to get through them all! What a brilliant idea! I need to give this twist on pesto a try.